Jim Souers receives award from Employer Support of the Guard and Reserve for leadership and philanthropy. Jim Souers of @MarconeSupply receives award from Employer Support of the Guard and Reserve for #leadership and #philanthropy. SAINT LOUIS, November 11, 2013 /3BL Media/ - Last week, Missouri Employer Support of the Guard and Reserve (MO ESGR) recognized Marcone Supply with its Above and Beyond Award. According to the ESGR website, the honor is given “in limited numbers by state committees to employers at the local level.” Just in time for Veterans Day, the award is on proud display at Marcone’s Creve Coeur corporate office. 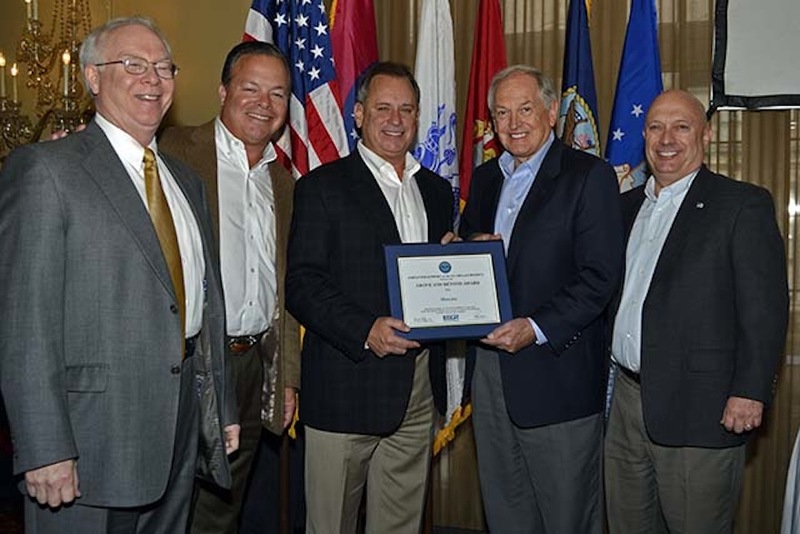 Under the direction of CEO Jim Souers, the St. Louis-based appliance parts distributor has become known in the community for its ongoing and multifaceted support of military members and their families. Through sustained relationships with various charities and organizations, Souers and Marcone have built a brand around their care for military personnel and their loved ones. “From Fischer House to the USO to MSCCN [Military Spouse Corporate Career Network] to their military discount and beyond—it is an impressive record,” says Lee Metcalf, MO ESGR Chair and US Navy Retired Rear Admiral. Marcone was founded in St. Louis in 1932, and has been family-owned ever since. It employs around 150 St. Louis area residents and over 800 people throughout its 52 North American locations, including several military veterans and spouses of active service members. Jim Souers and Marcone Supply receive "Above and Beyond" award from ESGR.